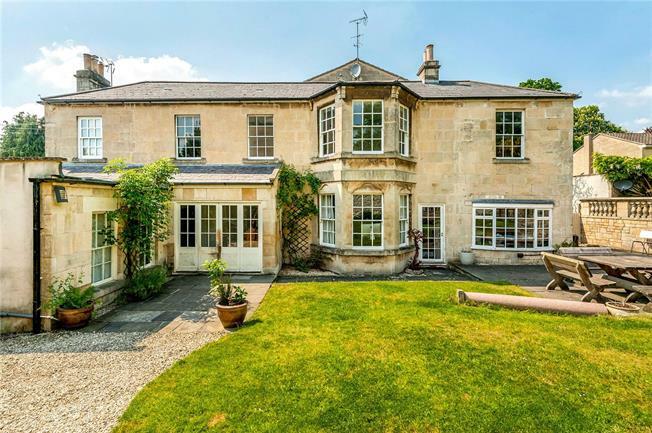 5 Bedroom Detached House For Sale in Bath for Guide Price £1,625,000. Victoria Lodge is a detached Grade II Listed family home situated in a most sought after location just on the edge of the Botanical Gardens of Royal Victoria Park. This unique Georgian home has evolved over the centuries including a Victorian double bay extension. The impressive entrance is decorated with a classic Bath stone pediment. The square reception hall provides a spacious entrance with a pleasant aspect onto the garden. The main reception room is a super family space whilst the drawing room has an open fire and bay window overlooking the garden. The kitchen is a major feature of this home with a tall exposed A-framed ceiling, a sleek and stylish kitchen including a four oven gas fired Aga and space in the middle for an oversized dining table. The master bedroom has the benefit from a large bay window and pretty central fireplace whilst its private bathroom is sumptuous with its black marble flooring and white suite. As well as the first floor family bedrooms, there is a ground floor guest bedroom suite including a kitchenette and sitting room; great for teenagers or could be self-contained if desired. There is also a self-contained cottage to the side of the garage that provides further ancillary accommodation. Victoria Lodge on Weston Road is situated on the far corner of the Botanical Gardens of the historic Royal Victoria Park. A stroll through the park and along Royal Avenue, past the famous Royal Crescent, will lead into the very heart of Bath. Truly a wonderful walk into town and a great location close to many amenities and with all the convenience Bath has to offer including excellent cultural and leisure amenities, many fine restaurants and specialist shops, museums, art galleries and theatres. Bath has good communications with Bristol and is approximately 10 miles from Junction 18 of the M4. There are high-speed train services from Bath Spa Railway Station to London Paddington (approximately 90 minutes). The gardens of Victoria Lodge are also of note with a terrace adjacent to the drawing room. There are two levels of lawn being large enough to play football and also including mature trees and a vegetable garden. Attributes such as a garden of this size plus a double garage and parking are very rare so close to town.